ONE OF THE KEY CONCEPTS in Catholic moral teaching about society is what is known as the preferential option for the poor. This is a principle intended to guide and regulate our approach to the world we live in and decisions about public and political issues, based on the teachings of Jesus in the gospels. It’s in short supply in this country at the moment, where the poor are suffering more and more while political leaders pursue their own expensive vanity projects. St John Paul II brought the concept of the option for the poor into mainstream Catholic teaching from the late 1970s, drawing it from the theological tradition known as Liberation Theology, originating in Latin America in the years after the Second Vatican Council. The theologian generally seen as the father-figure of this tradition is the Peruvian Dominican priest Gustavo Gutierrez, famous for his 1971 book A Theology of Liberation. 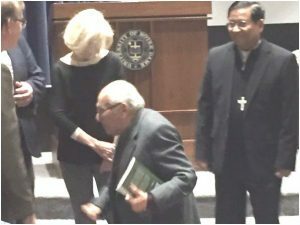 He is shown in this picture (in the middle), alongside the distinguished American theologian Professor Lisa Sowle Cahill from Boston College and the Salesian Archbishop of Yangon (Myanmar), Cardinal Charles Maung Bo. I took the photo last week at a conference in the United States where the three shown were among the keynote speakers, devoted to the Option for the Poor. It was a very full and important conference, with a great deal to share, but here, as we continue to try and deepen our understanding of our faith during Lent, I simply want to outline some of the points Fr Gutierrez made in his address. He gave this in Spanish, with an interpreter relaying his words as he went along, and a full translation will be published in due course. Over the years Liberation theology has gradually moved into the centre of contemporary Catholic theology; it is certainly essential for any knowledge of Catholic social teaching. Nor has the tradition remained static; it has changed and developed since the early 1970s, like the world we live in. Its defining characteristic is the insight that the message in the scriptures and the Christian tradition of liberation has an essential focus on those who are poor in every period of history and place: in every context how we do theology has to reflect the lived experience of the poor. In his lecture Fr Gutierrez reminded us that Liberation theology, as a distinct way of reflecting, grew out of Vatican II itself. One of that council’s teaching document, ‘On the church in the Modern World’ (often known by its Latin title Gaudium et Spes), broke new ground by making it clear that the hopes and fears of all humanity are the hopes and fears of the Church: we are committed to a unified view of history, not separate sacred and secular histories. In Latin America, this assertion gave Catholics confidence to apply to the poverty, inequality, injustice and violence of their societies God’s action on the side of the poor and oppressed which we encounter in the scriptures. This process was, and is, very threatening to the rich and powerful. Christianity is not simply a series of religious observances: it is a complete and integrated way of life, demanding that its disciples listen to the voice of the world. Fr Guttierez also drew on the teachings of Pope Benedict XVI in his first encyclical letter from the end of 2005, ‘God is Love’ (Deus Caritas Est). The pope is insistent in his letter that the practical work for the poor in the world must entail both charitable action and giving, and immersion in society and its problems. The two must always go together. A feature of Guttierez’ recent work has been an effort to root Liberation Theology in our spirituality as Catholics – our whole lives as Christian have to be integrated. Some of the devotional material produced by our Catholic aid agency CAFOD for the season of Lent (such as reflections on the Stations of the Cross) do this. 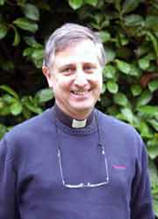 Lent and the approach of Holy Week are a good time to listen to Guttierez’ message and the poorest of the world. Our use of devotions like Stations of the Cross enables us to unite Our Lord’s sufferings with those of men and women who suffer most in the world through poverty, injustice, poor living conditions, racism and violence: those who suffer are particularly close to Jesus. We collect money (as this weekend for CAFOD’s Emergency cyclone appeal) and other goods (such as for the London Catholic Worker house also this weekend) in this parish; and these acts of mercy need to be joined to active campaigning work on behalf of the poor and listening to what the poor say. This is a spiritual issue: it’s about the sort of Catholics we try to be as we prepare to enter the most sacred time of the year.